My good friend, Tracey, asked me to make a bag for her to take to Quilt Market this week. After (much) debate, she finally decided on a slightly modified Super Tote! She loves linen so I used Essex linen blend in Sand along with some colorful appliquéd petals. Like my first time making the Super Tote (read about it here), I added a lined, exterior zippered pocket. Check out my tutorial on how to add the zipper here it works slightly differently since it's for the exterior and not the interior, but the basics are the same. Still, my absolute favorite part of this pattern is the gusset that gives the bag so much depth and body! For interfacing, I used Shape Flex (SF 101) on all the exterior pieces--I do not interface the lining of the back or the pocket linings, but I did interface the interior divided pocket that I added. For my open exterior pocket, I once again lined it, but I didn't add the piping (or fake piping like I used last time). This time I added a triple stitch to the strap. Since I opted to make the bag cross body, the strap was cut a bit wider and a lot longer than the pattern stipulates. I cut my strap 3.5" wide and used a .5" seam allowance so the strap finishes at 2.5" wide. 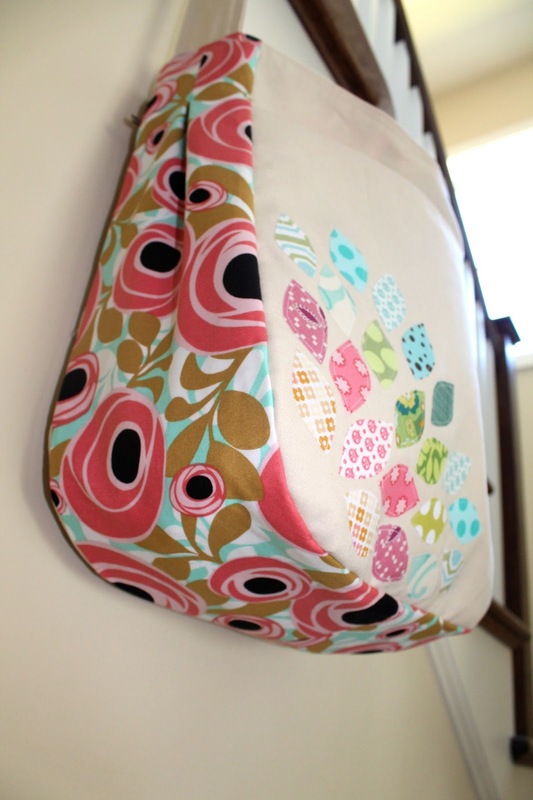 I find for crossbody bags, wider is better--you don't want a narrow strap digging into your chest! I added Shape Flex (SF101) to each side of the strap and I cut a piece of left over batting 3" x length of strap. 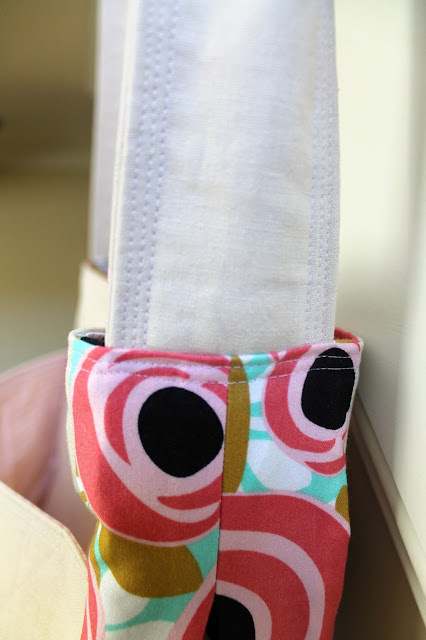 You don't want your batting (you could also use fusible fleece) to be the exact same width as your strap or you will have too much bulk in the seams. How long you cut your strap depends on how tall you are and where you want the bag to fall on your body. I also assembled the lining and exterior a bit differently this time. Because I was making a crossbody bag and I was having a hard time deciding if I had the strap length right before the strap was attached. Instead of leaving a hole in the lining for the bag to be turned, I folded the top edges of the lining and exterior pieces down 1/2" and pressed. Then I pinned around the top and pinned the strap in place so I could test out different lengths. Once I cut the strap down to the length I wanted, I inserted about 1" of the strap into the space between the lining and exterior. Then, I sewed around the top of the bag twice. 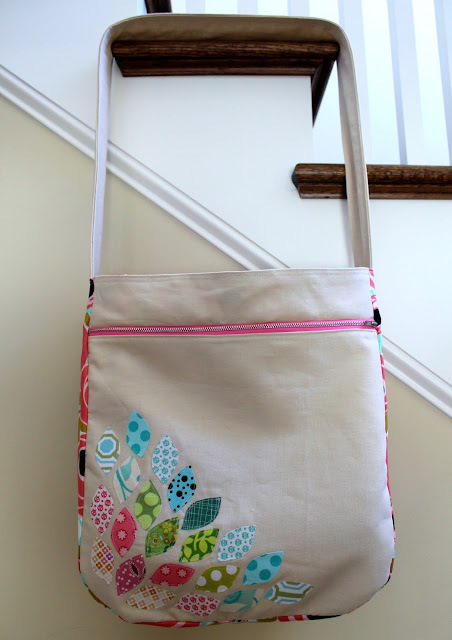 The applique was a lot of fun to do and added a pop of color to the linen on either side of the bag. Plus, I got to dig into my tiny scraps! For the interior, I modified the pattern by adding a flat open pocket to one side. It is divided into three compartments so there is a quick storage space for keys, a phone, whatever. I also added a magnetic snap closure instead of a zipper. These are quick and easy to do and, frankly, after all that applique, I was anxious to hurry up and finish this! :) Seriously though, moving the strap location made putting a zipper with ends on the side seem a little crowded. Looks like the perfect bag for Market! best Mother's day and Birthday and Market bag ever! You are so sweet to do that! I love all the little touches - it'll make market that much better. :) And be plenty big for any purchases I might need to make. Totally 100% FABULOUS!! Love it!! What a fantastic take on this bag! Love the applique and the crossbody tweaking -- beautiful AND useful! Lovely bag... the leaves are so sweet! Another great bag! Thanks for pointing out the tutorial for the external zip. I might have to copy your one strap bag, but might add some hardware to make it adjustable. Your blog is so inspirational! Kelly, this has sold me on making this tote. I absolutely love what you have done!!! I liked your previous version too, but after seeing this I'm downloading the pattern. Love, love, love it. Thanks so much for sharing. ps I always insert my linings this way too. Its way easier in my opinion, and you get a nicer fit of the lining. I have a really dumb question- trying to make my first real bag and picked this pattern. I LOVE your external zipper pocket and have been seaching for a tutorial- I followed your link for your tutorial, but it keeps pulling up an interior zipper tutorial. What am I doing wrong? ;) I am soooo excited to see this tutorial- thanks and have a marvelous day!